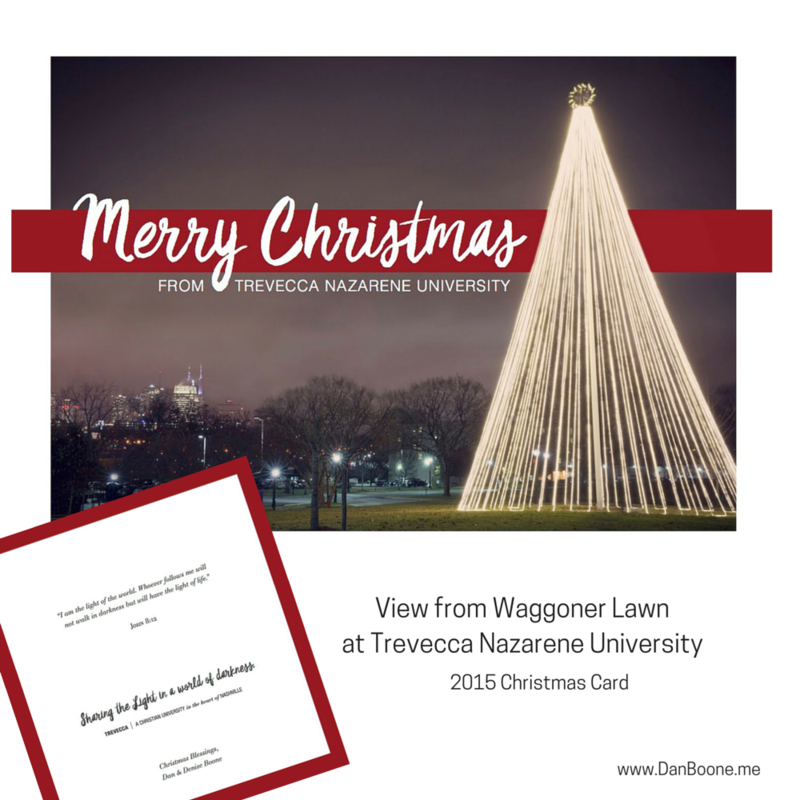 Each year, I’m pleased to share with all of you our Trevecca Nazarene University Christmas card. This year, we focus on Jesus as the Light of the World. 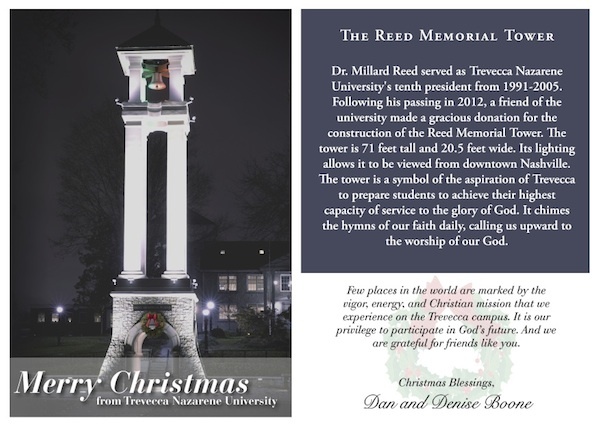 From our family to yours: May you have a blessed Christmas season! OK, you’ve been given $1000 and are required to spend it somewhere that will make the most difference. How would you spend it or give it away? I’d give my $1000 to Farmer Jason who manages our Urban Farm at Trevecca. A little background on Farmer Jason for you. I think we all have one. A teacher who impacted us in a way that we are forever different than what we would have been. A teacher who thought we could do more than we believed we could do. A teacher who inspired a bit of fear in us that we later came to call respect. A teacher who set a high standard and then helped us meet it. A teacher who taught more than the required material—because information came second to wisdom in their thinking. A teacher who forever lives in the balcony of our mind and always calls us upward. I went to the funeral of such a teacher the other day. His name is Michael Moredock. I never sat in his classroom. But I heard what students said about him for 8 years before brain cancer forced his retirement and then took his life 3 years later. They complained to me, the university president, about how hard he was in the classroom. Demanding, they said. Unreasonable, they said. Tough as nails, they said. Doc Moredock was an administrator and teacher in our Physicians Assistant program, a graduate program that fills the world with emergency room physicians, primary care office doctors, and surgical assistants. Trevecca established the first PA program in TN and regularly has 800 applications for 50 seats. The program is rigorous, demanding, and not for the faint of heart. Peter Drucker became my best friend the day he declared that one of the three toughest jobs was being the president of a small college. I selfishly agree. Leading a university challenges every natural instinct I have; for instance, the instinct to defend myself and fighting back. Thankfully, it has never come to fisticuffs. Most of the confrontations have been quite civil. In the small university, everyone assumes that the president is the final authority on everything – grades, financial aid, hiring, firing, student discipline, and interpretation of any policy. Rather than calling those who specialize in these things, they call me directly. They have heard something they did not want to hear and they want me to overturn the decision. It has taken me 10 years to learn a few basic lessons about fighting back. I’m a list maker. It keeps me focused on what else needs to be done. I love crossing them off one at a time until there is nothing else needing my attention. That’s 10. I’ll stop there for now. I am a very rich man. Make your own thankful list and post it in the comments. Don’t forget to download the free Scripture art of Psalm 136:6; you can find it here. Happy Thanksgiving! May you and yours have a blessed holiday!